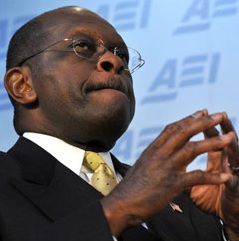 Herman Cain is projecting two Body Language signals no candidate should ever exhibit in this photo. His hands are oriented in what is know as a "Steeple". If displayed for short time periods, in the proper contexts, this can project confidence. However, in most settings, particularly when used for all but brief displays, it is often perceived as arrogance and projects (no doubt unbeknown to Mr. Cain) condescending attitudes. The higher the steeple, the stronger this emotional signal is transmitted and received. Herman also is displaying an "Inward Lip-Roll" (ILR). Positioning your lips in this fashion is a nonverbal indication of anger-related-anxiety and when it is displayed the person is calling upon inward reserves - for patience. When you see the ILR, patience is wearing thin - tread softly. The Republican Presidential hopeful was recently questioned about old accusations of inappropriate behavior towards two female employees of the National Restaurant Association while he led that organization in the early 1990's. Prior to this event being brought to light by Politico, the public had not been aware of these accusations.